This article will tell you everything you need to know about buying a new acoustic drum set for beginners. We go through the best drums sets available to buy online for entry-level and intermediate drummers. Acoustic drums sets are fantastic fun to play, and they have their place in almost every type of music. There are so many tech specs online regarding drum sets. This article will cut through all the babble and tell you exactly what you need to know! Let us start with our top pick of the best drum sets. After that, we will take you through the most important things to know when buying a drum set. Our Pick of 5 Best Drum Sets for Beginners! Very popular entry-level drums. Great mix between price and quality. The reliable Pearl Export series, very popular entry-level kits. If you want a solid drum set that that includes everything you need, has very decent cymbals, comes from a great brand, and comes at a surprisingly low price tag, you should consider the Tama Imperialstar drum kit. The particular formulations of high-end materials will provide you lightweight construction, stable tuning and faster assemble than other kits on the market. Due to Accu-Tune hoops that feature tension bolts, you will be able to change heads in a matter of minutes. 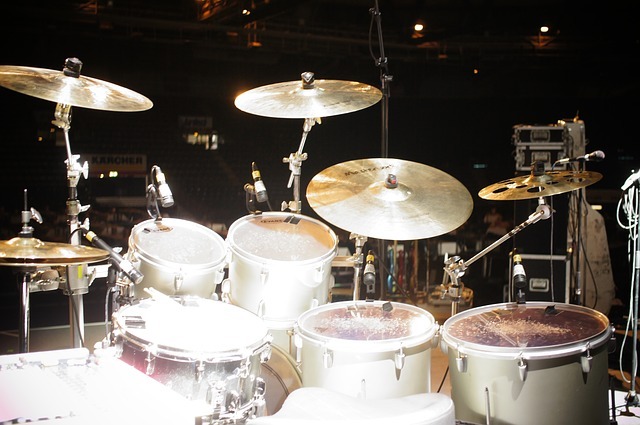 The combination of Omni-sphere and L-Rod tom holder systems are one of the most popular for most prominent drummers from all across the globe. This particular system will improve flexibility, provide you easy positioning as well as stability and resonance. The structure is durable and dependable, and it eye-bold construction will hold toms in place during the heavy playing. The stands will provide you a combination of durability, convenience, and stability for the budget-friendly price tag. The complete kit features everything you need for a start from hardware, stands, cymbals as well as pedals. The drum shells will provide you exceptional sound as well as balanced dynamics and natural warmth. Bearing edges are precisely made to provide you wide tuning range and enhanced sensitivity so that you can enjoy all the way. According to some users, snare drum skin tends to separate from the frame, which could be a problem after a while. However, you will still get a high-end drum kit that will stand the test of time. You should check it out thoroughly on this video! 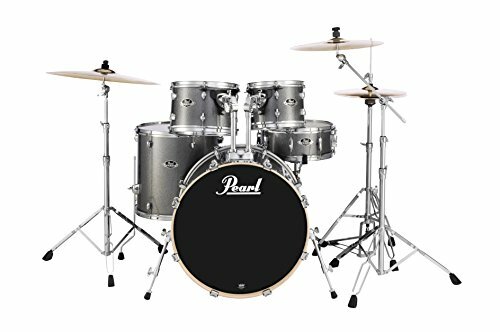 Pearl RS525SC706 Roadshow is one of the most popular entry-level drum sets available online, and it comes at a fantastic price. It will provide you 9-ply poplar shells as well as covered wrap finish for added durability. You should remember that poplar is standard wood that is used for drums within the affordable price range. It is also popular due to robustness, which means that you will be able to use it for a few years with ease. However, it has different sound characteristics than maple, which is the best choice but also expensive for novice drummers. The hardware contains one snare stand, two cymbal stands, and hi-hat stands. You will have no trouble supporting all the drums you got within the package. If you are a beginner, the hi-hat stand will be decent for you, but for more professional players, you will need to find a more stable solution for your everyday needs. At the same time, with the proper dampening techniques, tuning and maintenance, your toms, kicks, and snare will sound unusual for a long time. Shells come from 9-ply poplar, which is considered as entry-level, but you will still get a decent sound. The snare drum can quickly provide you consistent sound and high dynamic range, but you have to maintain it properly. If you neglect this particular idea, it will start to produce overtone, which will interfere with your playing. Learn more about this particular kit by watching this video! 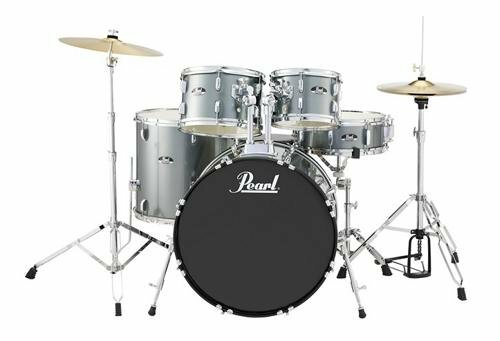 The Pearl EXX725S/C5 drum set is another set within the long running Pearl Export series, which has been a well known name for beginner drums for many years. It comes with maple shell materials as well as 930-series bass drums and P930 bass pedal. You will also get cymbal stands as well as hi-hat stands as an addition. The best thing about it is the ability to purchase it for a high price tag, which means that it is an excellent choice if you wish to get the entire drum package. It comes with a mahogany finish, which will deliver you a beautiful and vibrant sound when you use it. Apart from that, bass drum pedal contains efficient chain system, which means that it will uphold heavyweight, for additional durability. The attractive color makes it aesthetically appealing, and the convenience will increase when you find out that you can assemble it in a matter of minutes. It comes with all bolts and nuts you need to handle collecting. Opti-lock suspension system will provide you the ability to enjoy in high vibration without restriction, which means that shells can resonate much more than other drum kits on this particular list. The bass drum pedal has a lot of adjustment settings, which means that you will be able to adjust it based on your preferences. These settings will allow you to arrange it to enjoy in comfort during the performance. In this video, you will find everything you need to know about this particular drum kit! 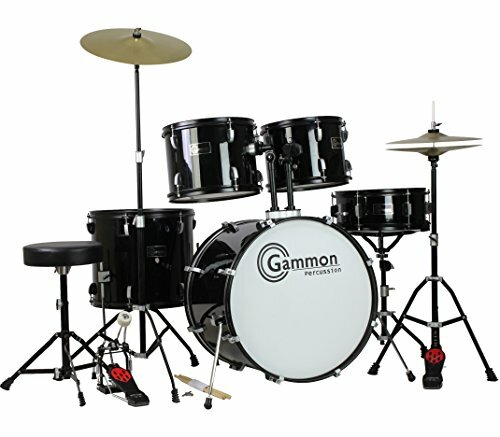 If you’re on a low budget then our recommendation is the Gammon Percussion Full Size Complete Adult 5-piece. The quality of the components don’t match the others on this article, but it does have everything you need to get started right away. You can find it in both blue and black colors based on your style and preferences. The complete set features stool heads, drumsticks, cymbals, chain driven pedals, full-size wood drums and other hardware you need. It is an excellent solution for beginner drummers, but if you are planning to use this regularly for gigs, then we recommend that you eventually upgrade the cymbals and the drum heads. We have mentioned above that it comes with five pieces, which means two mounted toms, floor tom, snare drum, and bass drum. That is the main reason why you should use it as the first drum set because you will have the experience of playing the entire thing. When it comes to sound, you will get an excellent solution for novice drummers, and it will not stand in the way from practicing and learning so that you can upgrade it as time goes by. This drum set can also come bundled with Evan’s SoundOff mutes, to help dramatically lower the volume of your drum set. If you need to practice quietly, then look out for that bundle, because it doesn’t cost that much extra. If you wish to see it, you should watch this particular video! If you really want to invest in a quality set of drum shells then check out the Yamaha Stage Custom Birch 5pc drum shell pack. Keep in mind, this doesn’t come with hardware and cymbals, so these would need to be purchased separately. Alternatively, if you own another drum set, you could swap out the drums with this shell pack. It will also provide you deep and rich sound so that you can get the most out of it. It is great for both novice players and professional drummers. It comes from birch wood, and it comprises a beautiful look that will increase the aesthetical value of this particular kit. At the same time, birch wood is an excellent solution because it will preserve sound quality and carry out vibrations necessary so that you can enjoy playing. It is simple to set up, and you will get a manual which is user-friendly so that you can set it and tune it up with ease. It uses Yamaha Enhanced Sustain System that will add resonance and improve the sound overall. Additional components that you will get within the package include ball mounts; die-cast claw hooks as well as resin-buffered clamps so that you can reduce rattling. Check this video to hear how it sounds! What does a full drum set contain? Snare: This is the main drum that sits between your legs. These are usually wider in length than height, and they have ‘snares’ on the bottom (resonant) head that cause a cracking sound when you hit the drum. The snare is a very important drum in your sets. Drummers often like to upgrade their gear; the snare drum is usually the first one they replace. Bass Drum (Kick drum): The bass drum is the most obvious drum in the set. It is the large drum (often 20″ or 22″ in diameter) with its front-head pointing outwards. It is hit with a bass drum pedal (and something two pedals using a double bass drum pedals, we will talk about that later in this article). Some bass drums have portholes in their front drumhead where you can put a microphone for live performances. You can also put muffling material such as a pillow inside the bass drum to give the sound more punch and decrease the overall volume a little bit. Toms: Beginner drum sets often have three toms. There are two main types of toms: Rack toms and floor toms. Rack toms are usually smaller toms that are often mounted with hardware above the bass drum. Floor toms a wider, longer and produce a lower pitched sound. Hi-hat: The hi-hat cymbal is one of the most critical parts of any drum set. We are talking about a pair of cymbals that are closed against each other and connected with a foot pedal. They provide a very dynamic sound. Crash: Crash cymbals tend to be smaller than ride and bigger than hi-hat. The primary goal is to strike them so that they can achieve a glancing blow. Drummers are using it to accent notes and transit from one part of the song to another. 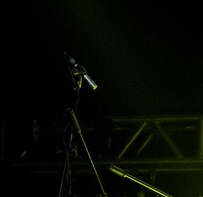 It is common in rock music especially in loud parts of the song. These are not always found on beginner drum kits, and large ones will have a richer sound and longer sustain than smaller ones. 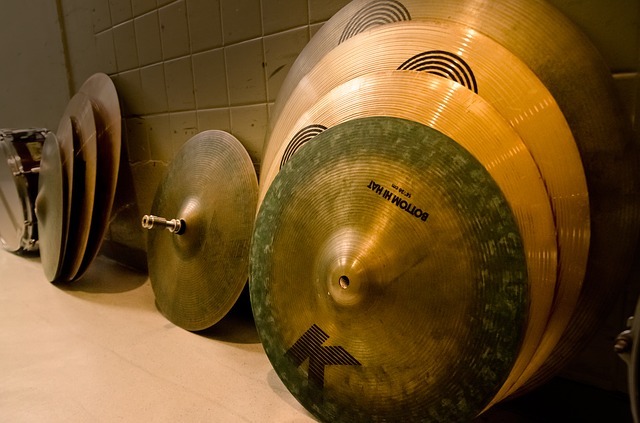 Ride: When compared with crash and hi-hat, the ride is the biggest cymbals and the fair size that you should get is at least 20-inches in diameter. In most cases, it will set on the right-hand side, and it is heavy cymbal that you can play with the tip of drumstick so that you can produce ping sound, which is distinctive in numerous musical genres and styles. Many beginner level drum sets do not feature a crash cymbal and provide one ‘Crash Ride‘ cymbal, which performs both functions. However, the quality of these usually isn’t great. 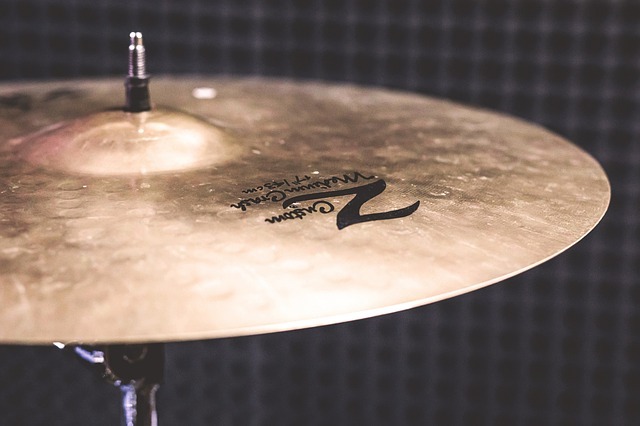 Splash: Splash cymbal tends to be the smallest one used on a drum kit, and in most cases, it is an addition that you have to make based on your playing style. You can find them in various textures and sizes. It is an excellent solution for making subtle accents, and they are small, so you will be able to place them between two crashes. China: Chinese or China cymbal is also a perfect addition that you can add to your drum kit. It comes with an up-turned edge, and you have to mount it upside down so that you can hit the bow and get trashy-crash sound. We can also compare it to a gong, but of course, a much smaller version. Cowbell: You can always place a cowbell in a song, and it will sound great (or possibly, slightly cheesy if used badly!). It is a metal percussion instrument used in Latin-American music, but it is also standard in pop and rock music. The typical place to mount it is to the right of the snare or on the hoop of the bass drum. You can use it as an alternative to riding in choruses. Cymbal stands: The primary goal of a cymbal stand is to support you to a cymbal you wish to use on your drum kit. You can find them in numerous forms such as straight stands; counterweighted boom stands, simple boom stands, multiple boom stands and zero-offset boom stands. Hi-hat stand: Hi-hat stand is an essential part of your kit because without it you will not be able to set up the hi-hat. Most of them come with retractable spikes so that you can see minimalist slipping and improve the durability of a hi-hat cymbal. Since the standard hi-hat comes with two cymbals, the stand consists of mating metal tube as well as rod, which is supported by a tripod and linked to a food pedal. The bottom cymbal is on the top and is fitted with an adjustment screw which will allow you to tilt it. On the other hand, the top cymbal is mounted up on the road and closed against the bottom by creating a foot pressure on the pedal. Snare drum stand: The snare drum is often situated between the drummers legs, which is why it needs a separate stand. It comes with metal construction in which you can fit the snare, but you have to match the sizes. Each snare comes with compatible stand, which means that when you purchase a drum set, you will get it within the package. Bass drum pedal: The single bass drum pedal entered the market at the beginning of the 20th century, and it became the central part of each drum kit. The idea is that it features chain, metal drive mechanism, and belt, and as you press it the mallet will move forward and attack a drumhead. In most cases, head comes from plastic, the wood of felt, but you can find rubber one attached to the metal shaft. Tom brackets: Some kits come with a frame that will allow you to install toms, while other feature brackets that you need to implement and fit so that you can use them. You will be able to adjust height based on your playing level and style. Floor tom legs: Since floor tom is standalone, it comes fitted with legs. You see a great drum set offer online, and you ask yourself “Is this too good to be true?” Check if it is a shell pack. Shell packs contain ONLY the drums. If you are buying a drum set for the first time, then it is highly recommended that you buy a complete drum set. The only shell pack set from our list of recommendations is the Yamaha Stage Custom Birch 5pc Drum Shell Pack, all of the other options above are FULL drum sets. 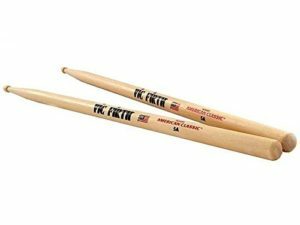 Even if your drum set comes with drumsticks, it is still definitely worth investing in a few pairs of decent quality ones. I generally recommend the Vic Firth 5As for beginners. Check out our article on how to choose a drumstick for more information. Great posture is a core for both drumming health and performance. Don’t just use any old chair lying around, a good drum throne should not be an afterthought. Check out our article on the best drum thrones. Get custom fitted hearing protection, or at least pick up a cheap pair of musician earplugs. Musician’s earplugs are really handy when attending concerts too. A practice pad is one of the most important items that every drummer should own. 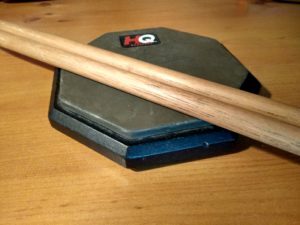 They are a fantastic, quiet way to practice your rudiments and technique. Check out our guide on practice pads to pick the best one for you. Drum keys are necessary to tune your drum set and fasten hardware in your set. They always go missing! It is worth having an extra one lying around, or put one on your keyring. Most drum sets do not come with cases. They can be useful if you are going to move your drum set around and protect your equipment frequently. However, it is optional. You can get away with transporting your drum set to gigs without cases. Do these drum sets include double bass drum pedals? Double kick pedals are a very convenient solution to having two kick pedals and beaters without having to carry around two separate bass drums. They are commonly used in metal music, but also feature in many other more complex drumming styles. Most new sets do not include double bass drum pedals. If you are on the lookout for one of these, then check out our article on the best double bass drum pedals. It is worth investing some money in a good set of these because cheap ones can be very unsatisfying to play on. Can I upgrade my kit later on? The majority of a drum set is replaceable and interchangeable. You can buy more expensive cymbals later and use the cymbal stands that you already have. Professional drum heads can make a tremendous difference to the sound of the drums. You can fit any brand of a drum head as long as they are the correct size. Check out our guide on the best drum heads for more information. Do I need to tune my drum heads? Drum heads need to be tuned. Even professional drummers can find it challenging to tune their drums. For beginners, you can follow some videos online to improve the sound of your drum heads. You can also buy a great little product called ‘Moon Gels.’ These remove some unwanted overtones of the drum sound. If you are not happy with the drum sound, then those are a great cheap option to check out. Can your kid play on a full-sized drum set? It varies based on their height, but in general, they can start playing on a full-sized drum kit from around 9 or 10 years onwards. Younger children may have difficulty reaching the pedals, cymbals and rack toms. If your kid were 4-9 years of age, then a junior drum set would be a better option, such as the Mending 5 Piece junior drum set. What are the most common types of wood used for drums? The most common type of wood for drums is maple, but due to its expensive price tag, people are trying to find other materials that are cheaper than maple. For instance, birch wood is great because it will provide you high frequencies as well as a good low-end punch. Mahogany: You will get warm and rich low end as well as muted highs and smooth midrange. In overall it is resonant and vibrant. Oak – You will get great low-end punch and pronounced mids and highs. Walnut – The overall sound you will get is a combination of warmth and greatness. Cherry – This is a sensitive type of wood for drums that will provide you bright sound overall. Poplar – It comes with smooth sound, which is highly sensitive and bright. How to make your drum set quieter? We can all agree that some popular myths about acoustic treatment and soundproofing can help your drumming since it is one of the noisiest instruments for your family, friends, and neighbors. 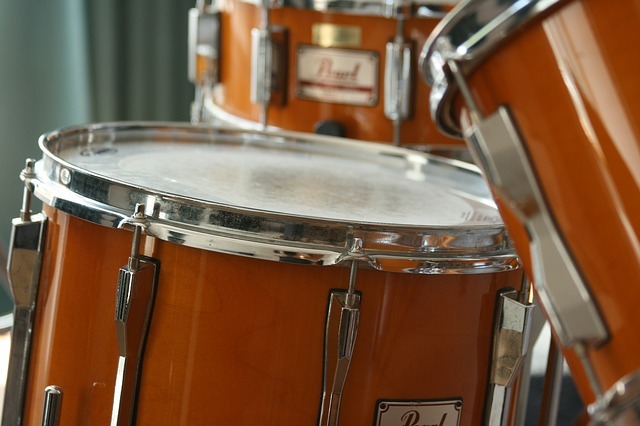 Therefore, the best way to make your drums quieter is by choosing an electric drum kit. On the other hand, you can also find low volume cymbals that will reduce the noise, but they are not great for playing with others. You can also find fit mesh drumheads so that you can cut the sound and replace your sticks with hotrods and brushes, but that will affect the playing style. You can also muffle your bass drum by adding household objects inside such as a blanket. Check out our muffling techniques at the end of this article. Playing drums is not that simple, and you will have to start from scratch if you wish to become the best. Of course, you will not be able to do it overnight, which is why you should let go that ambition and try to organize your time to play at least a few hours a day. 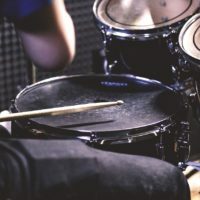 You can also check out our recommendations on the best drumming books, which will allow you to improve your drumming skills and learn firsthand about it. On the other hand, you can find online video tutorials that will help you learn basic skills that you can improve afterward with practicing. It is vital to search online for online courses and YouTube videos. You should also check out our recommendations on online drumming lessons. 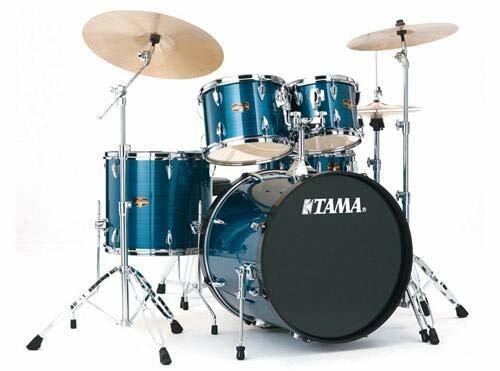 Tama – Tama is a brand of drum kits marketed and manufactured by Hoshino Gakki, which is a Japanese musical instrument company. They created the most expensive and professional drums since the very beginning, and you will be able to find numerous metal head drummers that are playing this particular brand. 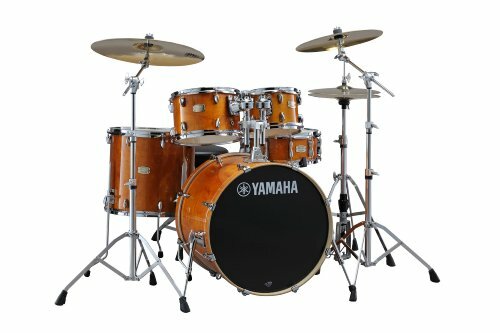 Yamaha – Even though it is widely recognized due to piano production, Yamaha drums are manufactured in two places in Asia and will provide you high-end professional drums. The vast array of exclusive woods such as oak, birch, and maple will give you the perfect sound and durability. Gretsch – Gretsch is a brand founded by Friedrich Gretsch in Brooklyn at the end of the 19th century. He created a business that was within his family, and they made both drums and guitars for Broadway. Ludwig – This is one of the most prominent US brands of percussion instruments that achieved immersive popularity after Ringo Star endorsed them during the 60s. German immigrants in the USA established it, and they create drum sets that are capable of withstanding heavy kicks. Mapex – Mapex is Taiwanese drum brand that produced a wide array of drums such as Horizon, Voyager that use maple and birch based on your preferences. The quality of these series is immersive, and everything features high-end wooden shells so that you can enjoy all the way. 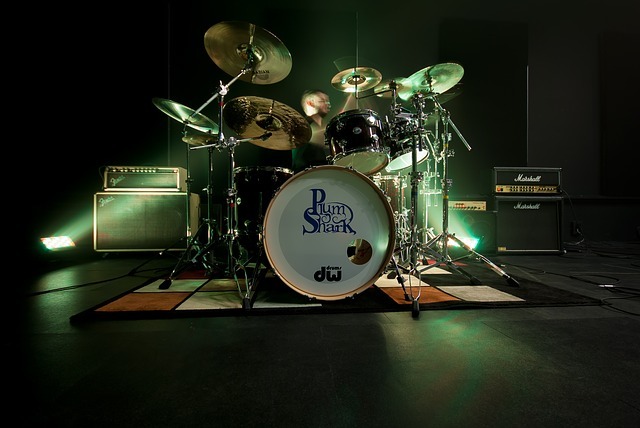 DW – Drum Workshop is the USA drum hardware and kit manufacturing company based in California. They entered the market by Don Lombardi who created a teaching studio. He used them for private lessons and workshops. However, Lombardi, as well as John Good, started making small drum equipment sales to cover costs and that lead to their prominence. Sonor – The company is one of the oldest existing drum companies that began back in the middle of the 19th century. They created thick and heavy shells from beech wood as well as furniture grade woods such as rosewood. One of the most prominent players is Phil Rudd from AC/DC and Nick McBrian of Iron Maiden. Stagg – Stagg drums are the basic and mid-level and perfect solution for beginner drummers. Of course, you can find luxury models as well, but in overall, it is ideal due to affordable price tags. It comes from Belgium, and you will be able to see numerous budget-friendly instruments from drums to guitars and studio equipment. Premier – Premier drums were responsible for numerous things in the era of music. Even though British people tend to neglect this particular brand, people in the USA consider it as a classic. It started back in 1922 by Albert Della Porta, who was a professional drummer. After a while, it was the standard choice for many drummers, from acts like Genesis to Massive Attack. If you need a quieter practice option than electronic drums could be a great option. Check out our article on the best electronic drum sets for more information. We have presented you with a comprehensive guide on the best drum set for beginners that you can find on the market. As you can see from everything we have mentioned above, it is not that simple to find the first drum you should use. Therefore, you should reread this particular article, so that you can determine the best one for you and that will allow you to make a quality purchase. Editor’s Choice – It was a difficult decision to decide between the Tama Imperialstar and the Pearl RS525SC706 Roadshow as our top recommendation. However, in our opinion, the overall drum sound, the Meinl cymbals AND the inclusion of a crash cymbal and crash stand tip the Tama Imperialstar in the favor of our Editor’s choice. However, the Pearl Roadshow is still a fantastic option, and often at a lower price. Budget Option – The Gammon Percussion Full Size 5-piece Drum Set is almost always going to be the cheapest option on this list. It is a perfect solution for people that have a limited budget, especially if you have in mind that you need a basic drum set for a beginner.